POSTURE IS THE WAY WE SIT, STAND, WALK, KNEEL OR SQUAT. IT IS DETERMINED BY THE STRUCTURE OF THE BODY AND CAN BE INFLUENCED BY GENETIC AND EMOTIONAL FACTORS. 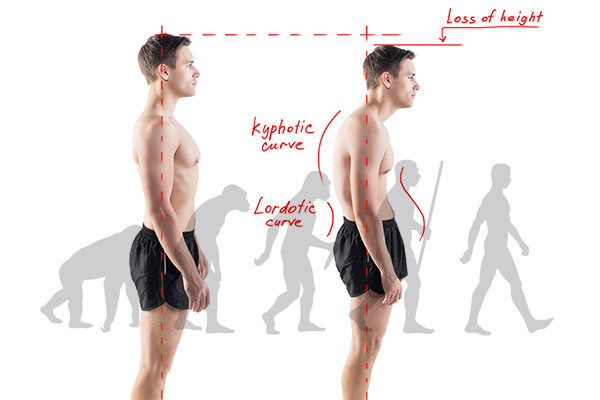 OUR MODERN LIFESTYLES, COMBINED WITH FORCES OF GRAVITY, CAN RUIN OUR HEALTHY UPRIGHT POSTURE. An incorrect posture can potentially lead to injury and pain through unbalanced supporting muscles. Specifically, a poor lower body posture can affect the way you walk, sit and stand. This can put increased stresses on areas left weak, such as the lower back, due to the surrounding muscles providing insufficient support. ‘Pelvic neutral’ is a good lower body posture to assume. One way to find this position is to lie on the ground with your knees bent, keeping your feet on the floor. Tilt your pelvis backwards, flattening your lower back against the floor, then tilt your pelvis forwards by arching your lower back. Pelvic neutral is the halfway point between these two end points and ensures an optimum position for the lower spine, pelvis and the surrounding muscles. One of the most common poor postures is ‘lower crossed syndrome’. The lower back muscles become unbalanced causing the pelvis to roll forwards. 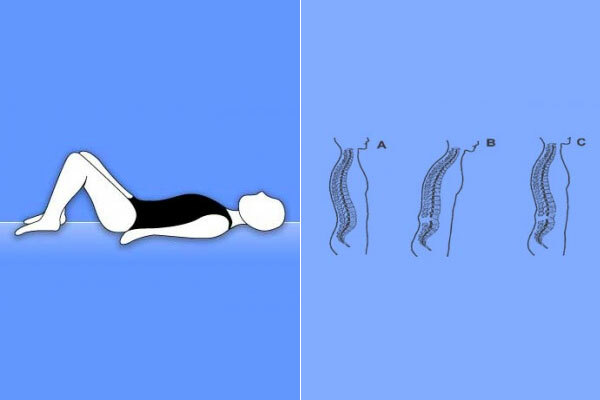 This results in weakened abdominal and buttock muscles and tight lower back muscles creating an increased curvature in the lower back (hyperlordosis) as shown below. As with an upper body poor posture, if this posture is not addressed, the normal length of the postural muscles change, becoming unbalanced and weak, potentially causing problems that can affect the joints of the spine and make them more susceptible to injury. Adopting a military posture with your shoulders pulled back and downwards, the back straight and your tummy muscles pulled in towards your spine can help to keep the muscles balanced and reduce posture induced problems. To prevent some of the pain from a poor posture, pull the belly button in towards the back of your spine using just your stomach muscles, remembering to relax and breath at the same time. Hold this ‘brace’ for 10-15 seconds and then relax. Combining this exercise with rolling the shoulders backwards and downwards can help maintain a healthy posture. If a bag is carried, a rucksack is the best option as long as it is carried over both shoulders. Adjust the straps so that the bag is held close to the back and weight is evenly distributed. Keep it light – make sure unnecessary excess weight is not carried. Good sensible footwear can also help to maintain a good posture and reduce back pain. Not only does wearing the wrong size bra affect how you look, it can have a detrimental effect on your posture. The British Chiropractic Association and figleaves.com have teamed up to educate women on the importance of wearing the correct bra size. Their survey revealed that nearly a fifth (16%) of British women have never been professionally measured for a bra and for those that have, 77% found they had been wearing completely the wrong size. Lift up your arms to see if the underband is tight enough. Check that the underwire is still fitting on the body. If you are still unsure, here’s how to judge: the underband should fit firmly against the body so that it does not slide around or move away from the chest as you go about your daily activities. The underband of a bra provides the majority (80 per cent) of support for the breasts, with the straps providing just 20 per cent. If the bra straps are digging in it could be because the underband is too loose and you are over adjusting the straps to feel supported. When you do this the straps pull the bra up at the back, which is another tell-tale sign that the band is too loose – so in this case we recommend that you try a smaller band size. Alternatively, you may just need to loosen the straps. If you are not able to go outside in the cold or prefer to exercise in the convenience of your own home, why not try stretching exercises or on the spot jogging? Moving around through house work or cleaning can also help. Dancing, Pilates or simple yoga and relaxation exercises are also great ways of stress relieving exercises. Why not create a yearly calendar health plan with weekly activities and healthy recipes to have each week? Keeping a brief record of what you eat and how much exercise you do. It is important you stick to this so get a friend or family member to support you.